The necessary evil of the dreaded vignette... I came into this vignette journey bright eyed and bushy tailed. I thought to myself- I’ve done mock rooms for commercial work- I can definitely take on this task! Having an entire warehouse filled with amazing vintage furniture and decor at my disposal would make this easy. So I off I went! I embarked on my first vignette journey. First, I decided on the type of room I wanted to display and the vibe that I was going for. I began to wrangle a few heavy furniture pieces myself that I thought were perfect. After trying relentlessly to carry a huge dining table, I finally gave into my feminist “I can do anything” mindset and had the warehouse staff help me move the items (shoutout to the crew). Once the large pieces were in and the “room” was arranged as I wanted, I began to hunt for decor objects. If you’ve ever been lucky enough to see our back room- you know what a feat this can be! It’s like trying to find water in the desert in the middle of August while playing jenga. A very weird combination- I know. I finally found the perfect decor pieces needed to finish up my room after a few hundred steps back and forth from the floor to the back room (at least I was getting my exercise in). After a few tweaks here and there, I was happy with the results. My plan was to change it up every week or so to keep it fresh. Overall, I was thrilled with the execution of my first vignette. After the first day, my room was completely picked over. 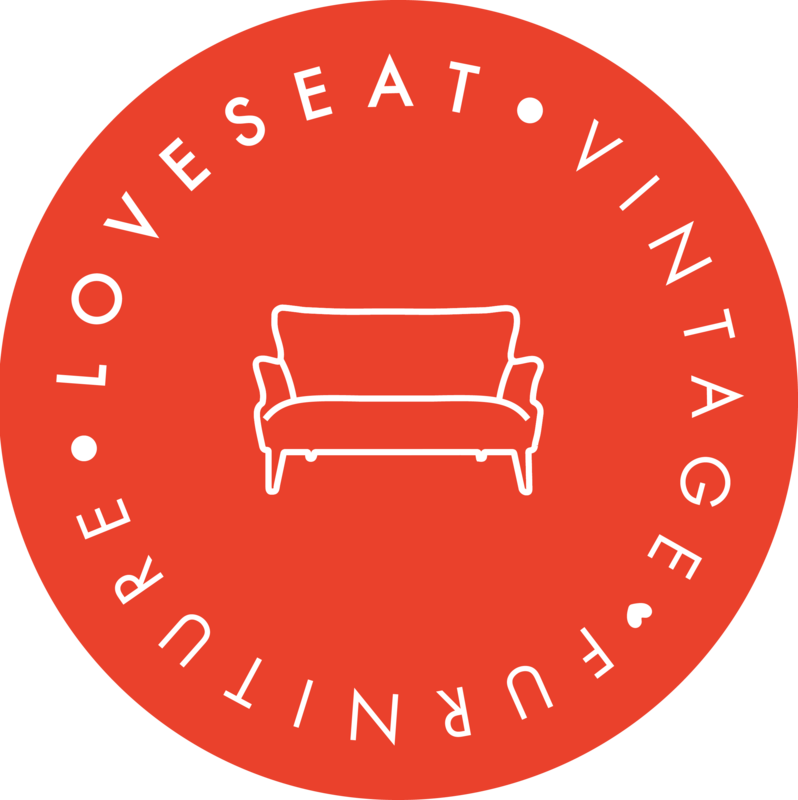 The lovely Loveseat customers snatched up the amazing pieces I had curated. I was beyond ecstatic that people were inspired by the room and gave new homes to these pieces rich with history. Then the battle began! Everyday that I came into the warehouse, I would check the vignette to make sure that it properly showcased our pieces and that everything was intact. More often than not, I came into a room that had been picked over by our customers from the previous day and would have to be redone (a great problem to have). This is where my love-hate relationship with the vignette began. A now once a week job turned into an everyday job- scouting new pieces to keep this little showcase full and cohesive. With our everyday arrival of new goodies, I have yet to experience trouble finding new pieces. I’ve even seen customers take photos while relaxing or reading in the space. Wandering a space like this is always a great way to gain inspiration and fuel design ideas for your own space! So I will indeed keep these vignettes coming. The war of the vignette will not stop. I will produce new rooms for your eyes to feast upon in the warehouse. Also, if you have any suggestions or would like to see a certain type of room- feel free to call or email us! If you’ve made it this far reading and I have yet to bore you, I will try to impart some wisdom that I have learned over the years in home decorating. If you are looking to revamp a space and only change a few things, there are some tweaks you can make on a lower budget. Or, if you are overwhelmed by the all the fun things in the warehouse, we are here to help! It may be hard to find that perfect piece hidden stacked to the ceiling in our twenty, beautiful aisles. Here are a few ideas for you that may be life changing, or at least save some time and energy. As a side note, I also do sales here in the San Diego Loveseat location and love when people bring in pictures of spaces and ask for advice! So feel free to come in and challenge me, I love it. Ditch the “everything in a room has to match” rule. Many people come in looking for sets. You have to remember that we sell vintage furniture so we don’t always have sets; we have mostly one off pieces. Instead of choosing matchy matchy pieces, you can mix and match by color (choose a color palette made up of colors that are complementary to one another), style, and overall shape and feel of furniture. Often times the eclectic mix is appealing to the eye and keeps everything interesting. After all, this is why you chose a vintage furniture store and not IKEA. Disclaimer: there is absolutely nothing wrong with IKEA- IKEA is a great place but having a mixture is key. So go ahead and mix that IKEA bed frame with a vintage dresser. I dare you! Scratch that! I DOUBLE dare you! Think outside the box. You don’t necessarily need to buy a coffee table to act as one. You may decide to use a vintage trunk with glass on top or an ottoman that serves as a coffee table and foot rest. What is better then double duty? Two functions for the price of one! Do not let those scratches scare you! Since vintage furniture had a past life, often times there is some patina on it. You can choose to embrace this or there are several inexpensive ways to fix it. Also, remember you are being environmentally friendly by getting that piece- reduce, reuse, recycle! Keep it up- the world needs you! Keep an eye on our website! 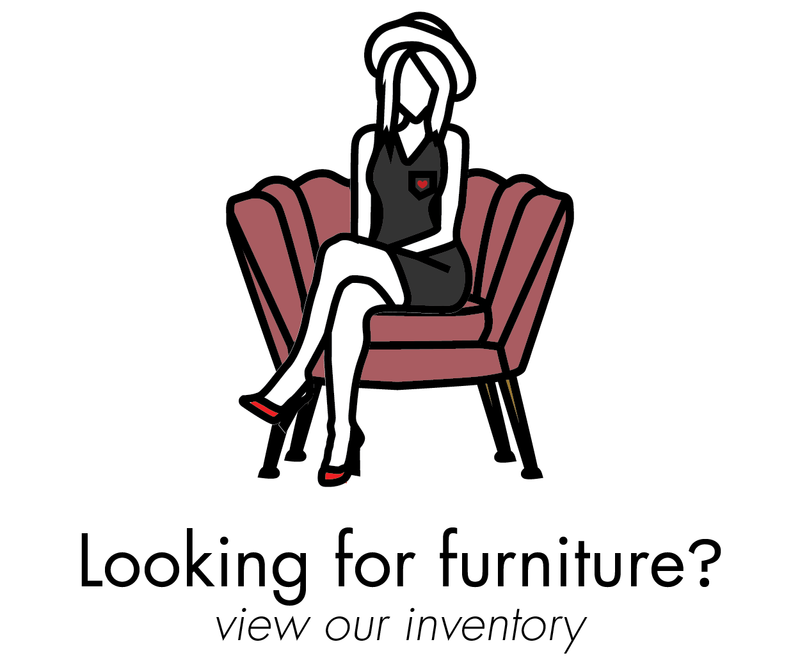 We are constantly adding inventory daily; so go ahead and bookmark loveseat.com to be the first to see the new pieces! You can purchase online and then come visit us and take a look at it before fully committing! If you don’t like it for whatever reason, we’ll issue you a full refund. We also reduce prices after items have been here for a certain period of time to keep everything fresh and new. Side note: stalking is totally acceptable while you’re waiting on the price on that fabulous velvet green sofa to drop! Check out our decor objects. These little pieces may just help you with the final touches in your room to pull the whole look together. A simple, small mirror or new lamp may bring new life to your space or help to open it up! Measure, measure, measure. I cannot say it enough! It is so important to know how big your space is and what the right pieces are for the space. Measure before you come in to have an idea of what size furniture will fit in your space. The last thing you want is for your cute craftsman style house to be overrun with huge furniture making it appear smaller. We have plenty of measuring tapes in the warehouse and dimensions listed on the price tag and our website. Oh ya...here is a peek into the vignettes. Annie wants to live in a world filled with small artisan businesses, vintage clothing and furniture to reduce environmental impact that come bundled with amazing Stumptown coffee and a planet where all animals are treated humanely. Pretty easy right? As a prop and wardrobe stylist with more than 10 years of experience, she’s worked for Homegoods, Men’s Health Magazine, United Airlines and many other commercial clients. She has recently been doing more interior design work and has a passion for all things vintage. She moved to sunny San Diego from Boston with her two spunky dogs. When she’s not working she can be found exploring the outdoors while taking photographs or trying to convince her better half they they do indeed need all the dogs in the animal shelter. She now works at Loveseat Vintage Furniture in the sales department and is happy to take on any design challenge.